A small bout of spring cleaning this weekend inspired me to take a look at all of my unfinished projects I had laying around. I was shocked to realize how many I had. 31. 31 unfinished projects, many of which just need the ends woven in. Several that may need to be frogged. Some I just don't know what to do with. So before I start any new projects - I must finish off a least 5 of my UFO's. I have divided my UFO's into 4 categories below and provided a brief description. The photos are not very good, but I just wanted a snap-shot. Finished objects will get proper photographic treatment. 1. Socks for my niece - since she lives in another state, I decided to knit a tube sock and add in an afterthought heel. I finished the first one and measured it on her last time we were visiting. 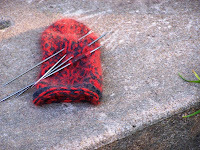 But of course I have forgotten important things like needle size and how many stitches I cast on. And where the heel should be. If I can remember the needle size, I may cast on for the other sock soon. 2. Country Socks - From Folk Socks. I am past the heel on the second sock and then just need to sew in the ends. 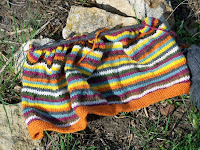 These are rather thick socks and with the warmer weather, I have not been as interested in finishing them. 3. 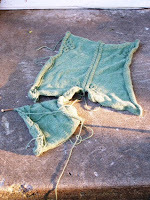 Green Alpaca Vest - I started this in January and it sat on the needles since my classes started. The back is done and one side is over halfway complete. 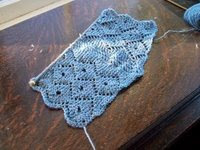 Need to determine where I am in the pattern, but once I do so it should be good for knitting in the car. 4. 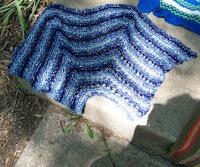 Made-up shawl pattern. This is an old, old project. Started over a year ago. One Christmas, Target had some novelty yarn in their $1 section. My niece got me several skeins, including a weird ribbon-like yarn (see close-up). I decided to use it as a carry-along with some coned, multi-colored Cotton yarn I purchased at the Yarn Barn several summers ago. 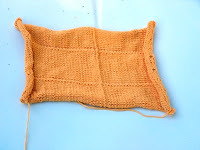 I really like the resulting fabric, but is it knit on size 10 needles so the knitting is not smooth. I just never get in the rhythm of the knitting. But I want to finish it. Maybe if I work on it just a row each day. 5. Hatband - This will become a hat Dulaan. 6. 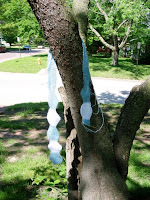 Snowball scarf - This is something I came up with fooling around with some leftovers. Just need to finish off one remaining "snowball". 7. 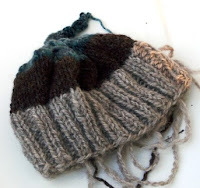 Dulaan Hat made from my handspun. Just needs ends woven in. 8. Dulaan Scarf from my handspun - need to sew pieces together and weave in ends. 9. 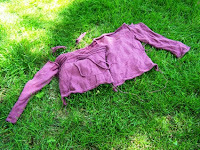 Purple sweater - This is a really old UFO. All I need to do is block it and seam up the pieces. 10. Another Dulaan Hat - needs sides sewn up and ends woven. 11 and 12 - Two cotton bibs (pattern from the Mason-Dixon Girls). Just need ends woven and buttons sewn on. 13. 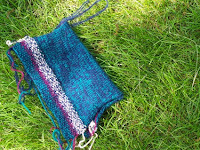 SOAR Silk Bag - Need to close of the bottom with a three-needle bind-off, sew up sides and weave in ends. 14. 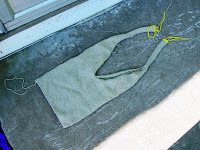 Cotton Bag - Kitchner handles together, sew in ends. Add embroidery? 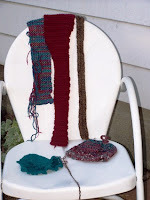 15-19 - Scarves and Hats for Dulaan - just need ends woven in. Two hats and the red scarf - finished!! Those that will visit the "frog pond"
20. Hemp hand-towel. This is technically finished but it is not the right size for a hand-towel. I will rip it and make something else from this yarn. 21. 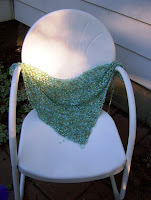 Handspun yarn scarf - the scarf is worked in a mistake rib, but I think this yarn really wants to be lace. Or something else. 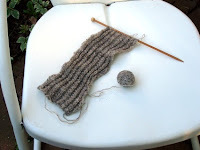 It is not happy as a mistake-rib scarf. 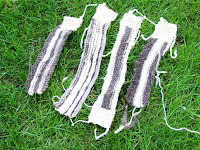 Three "blankets" - or maybe just rather large swatches. In each case, I was just interested in making fabric. No idea about what to do with the fabric when I was done with it. But I rather like all three pieces and don't want to rip them out. Maybe I could make pillows with them. Any other ideas? 22. 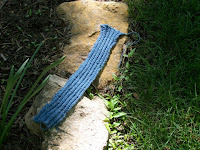 - Mission Falls Cotton Strips - One of the very first things I knit. I love the colors, love the stripes. All ends are woven in, but I just don't know what to do with it. 23. Naturspun Sport - Playing with color and slipped stitches. 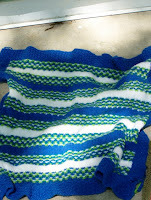 I think this was to be a baby blanket for my nephew (who is now almost 1.5 years old). But it was too small. Again, I really like the colors and the fabric, but I just don't know what to do with it. This one still has a lot of ends to be woven in. 24. 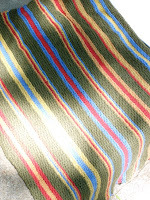 Log-cabin blanket - this project was started while I was finishing up my dissertation and had ALOT of reading to do. 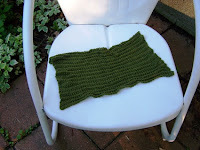 Long stretches of garter stitch is perfect for knitting while reading the ecological literature. But I ran out of the purple yarn and that brown for that matter. I just don't know what to do with it. 25. 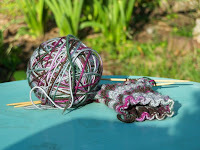 Socks with the STR Tide Pool Yarn - I'm not crazy about how this sock is turning out. Maybe this yarn wants to be a chevron scarf. Or maybe combined with another yarn. 26. Blue Sweater Vest - The floral motif should be more centered on the back. The knitting is sloppy. I love this yarn (Angora Tweed by Garnstudi0), but my understanding is it is no longer being made. I hate to use a yarn I love so much in something that is not great. This will probably be making a trip to the frog pond. 27. 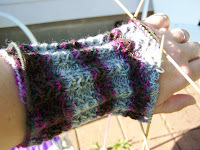 Anatolian Mittens from Folk Mittens. The mitten is too small, the yarn is not the best for colorwork, the book with the pattern has been returned to the library. 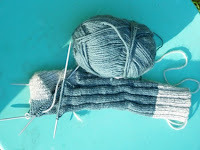 It is very likely that this will remain an unfinished mitten for a long time. Maybe forever. The yarn is very difficult to pull out. 28. Fortune Cookie Bag from Folk Bags - I thought it would be bigger than it is. I don't want to knit the i-cord handle. Probably another candidate for the frog pond. 29. 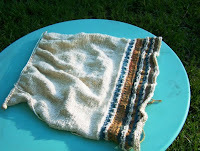 Half of a small poncho. My own design using a very pretty ribbon yarn and an acrylic/mohair blend yarn. Another piece that I love how the fabric turned out, but the whole thing is smaller than I expected. Plus, I did not write down my pattern and probably would not remember it. Besides, ponchos are so 2005. It might be cute as a little girls capelet if I were to somehow add ties. 30. And finally - the nordic diamonds scarf. I am almost ready to send this one to the frog pond as well. I just think the yarn wants to be something else. Whew!! I had no idea.